Merz Apothecary is an old-timey corner drugstore-style pharmacy with locations in Lincoln Square and the Loop. I took myself over to the Lincoln Square location, which is closest to their original location to have a look at what was on offer. 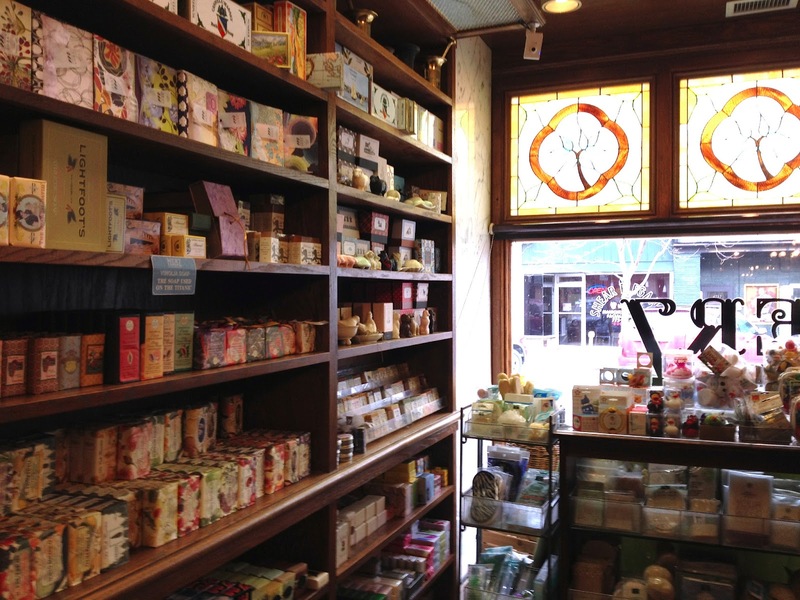 It's really charming, with stained glass detailing in the front window and shelves packed with everything from Burt's Bees products to holistic medicine ingredients. With the sheer number of products packed into the relatively small space, it was a little difficult for my brain to sort all of the input! Full to bursting with old world charm, the store also stocks a rather special brand, one that can be a bit difficult to find in stores (as opposed to on the internet) in the U.S., in my experience: Dyptique. I've been dying to take a whiff of some of these candles since they first popped up on my radar about a year and a half ago, and I seized my chance yesterday to make my way to this adorable spot. I have to say, I could not have possibly imagined how much I would enjoy the scents of their many very expensive candles. I desperately wanted to obtain a Figuier candle right then and there, but the banking gods frowned upon me and I decided against it, lest I raise their ire further. I also found Choisya and Baies rather enticing, quelle surprise. But the single most captivating item was the Philosykos Eau de Parfum. Oh my, it was the most heavenly fruity scent that has ever graced my presence, distinctive without being overpowering, and distinctly feminine. At $140.00 for 75mL, it's up there, but I intend to make it mine some time in the next 12 months. I'd be interested to see whether or not it suits for the summer months, but I have the sneaking suspicion it's a good year-rounder. Oh, Marc Jacobs Daisy, shall I forsake you so soon? Non, I do still adore you, but Philosykos, you will be mine. A budding love affair, indeed. N.B. Chicago is home to one of the few Dyptique boutiques in the United States, and I do intend to take a trip there when I make my first purchase, but it is rather less conveniently located than Merz, and the weather was really not too pleasant yesterday. I could and probably would spend hours exploring this place! I love all the beautiful packaging and miniature bottles, it takes me back to playing dress up with my mom's makeup! I just discovered Demeter fragrances and I'm obsessed. omg magical!! it's SO GERMAN!! My mom used to have the foin coupe and one of the woodier dyptiques when we were little. I wish there were a place you could smell them all lit before you committed to one. Empties #1: Fill 'er Up?